In 1941, Russian-born British journalist Alexander Werth observed the unfolding of the Soviet-German conflict with his own eyes. What followed was the widely acclaimed book, Russia at War, first printed in 1964. At once a history of facts, a collection of interviews, and a document of the human condition, Russia at War is a stunning, modern classic that chronicles the savagery and struggles on Russian soil during the most incredible military conflict in modern history. As a behind-the-scenes eyewitness to the pivotal, shattering events as they occurred, Werth chronicles with vivid detail the hardships of everyday citizens, massive military operations, and the political movements toward diplomacy as the world tried to reckon with what they had created. Despite its sheer historical scope, Werth tells the story of a country at war in startlingly human terms, drawing from his daily interviews and conversations with generals, soldiers, peasants, and other working class civilians. The result is a unique and expansive work with immeasurable breadth and depth, built on lucid and engaging prose, that captures every aspect of a terrible moment in human history. 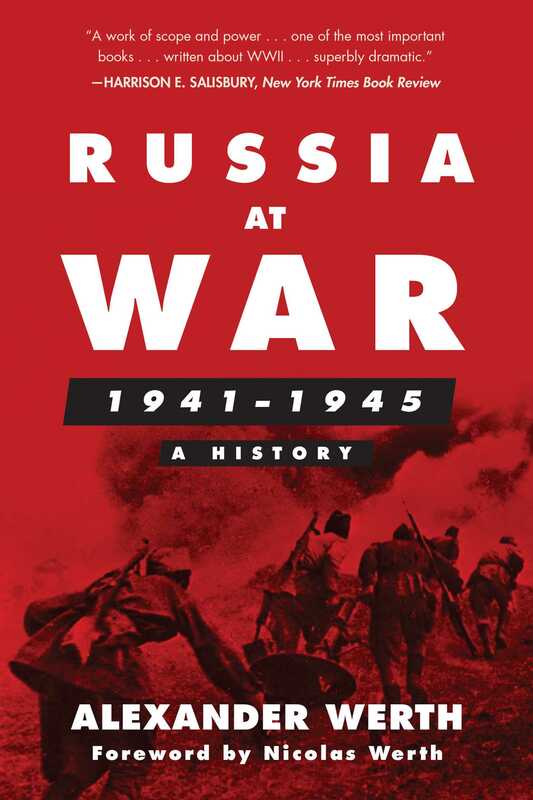 Now newly updated with a foreword by Soviet historian Nicolas Werth, the son of Alexander Werth, this new edition of Russia at War continues to be indispensable World War II journalism and the definitive historical authority on the Soviet-German war. "Magnificent . . . . It fills a great void. . . . the best book we probably shall ever have in English on Russia at war." "This is not merely a history (although it happens to be an excellent one). It is not a collection of personal reminiscences (although it incorporates many). It is not a scholarly examination of Russia during the critical years 19411945 (although it puts under close analysis many events during that period). . . . [Werth's] Russian panorama has the depth and vividness of a Vereshchagin warscape. His descriptions of Nazi atrocities . . . are almost too terrible to read. . . . [Russia at War] overflows with the contradictory, the half-understood, the mysterious, the impossible to explain. . . . It bears comparison with William L. Shirer's The Rise and Fall of the Third Reich as a work of scope and power. . . . One of the most important books yet written about WWII . . .superbly dramatic." "There is no book in any language with which to compare this monumental but exceedingly readable history of the Nazi-Soviet war . . . in savagery and hatred it was the biggest war in history . . . an engrossing and terrifying book." "Engrossing history . . . spellbinding narrative." "Monumental and absorbing. . . . An epic work that will fascinate the ordinary reader." "Alexander Werth was one of the greatest war correspondents of the Second World War."